Last night's prejudging clearly defined the stakes of the 2012 Mr. Olympia—reigning champ Phil Heath was the definite favorite, and Kai Greene was the only man who could beat him. It was a two-man race to see if Phil would become a two-time Mr. Olympia. The 2012 finals began with the individual posing routines, where each of the 19 Mr. Olympia contestants had the opportunity to present himself in the best light. Many who attend bodybuilding contests enjoy this round best, because it allows bodybuilders to display the artistry and beauty of the sport. While many of the bodybuilders hit the mandatory poses, they also performed less common poses—and even a dance routine or two. This is why they're called bodybuilding "shows." After the individual routines, all the Mr. Olympia competitors were called to the stage for the final judging round. Tonight's callouts played much the same as last night: Phil and Kai were called out first, but this time they were unchallenged. There was no chance any of the other 17 men could break the top two. This was a smart strategy by the judges: They defined the stakes as one man against another, heightening the drama. This is why they're called bodybuilding "competitions." The staging was great from the audience's perspective. A screen showed images of each bodybuilder training, then rose to reveal that bodybuilder standing behind it as his posing music began. Great entrances help enhance a show. Phil Heath was the last competitor to perform his routine, and he began it with a menacing glare—just in case you weren't taking him seriously. Heath is one of the most complete bodybuilders in recent memory, and yet his eyes may be his standout body part. That's a whole different type of freaky. 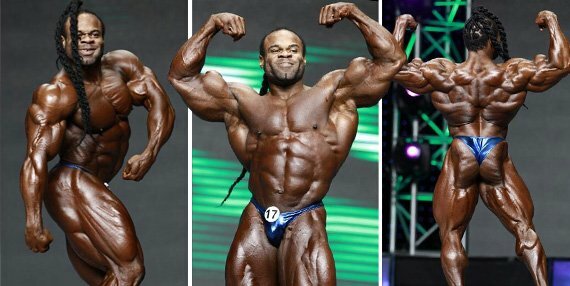 Kai Greene savored the stage as usual, contorting into all sorts of unique positions. When he was younger, this worked against his stage presence. Now, it only enhances it. During his free posing routine, he also unleashed his long braids. After the individual posing routines, the show flowed smoothly and directly into the judging round. During this round, Kai Greene's hair was pinned back in place on top of his head, making him seem much more decisive than Hamlet ever was on the whole "to knot, or not to knot" conundrum. During the mandatory poses, it was just Phil and Kai in both the first and final callouts. The judge announced each pose, but Phil played defense and didn't make a move without first considering what Kai was doing. Before hitting each pose, Phil either turned toward Kai or checked him out through his peripheral vision. Kai seemed oblivious to this, hitting poses at his own pace—whenever he felt like it. This was the only weakness of Phil's performance over the weekend: He was a little tentative trying to predict what Kai would do. After Kai and Phil returned to the lineup, the judges asked six competitors to step forward. The second callout included Shawn Rhoden, Dexter Jackson, Toney Freeman, Branch Warren, Dennis Wolf, and Evan Centopani. The stakes are huge from one placing to the next at this level, since the prize money changes dramatically. 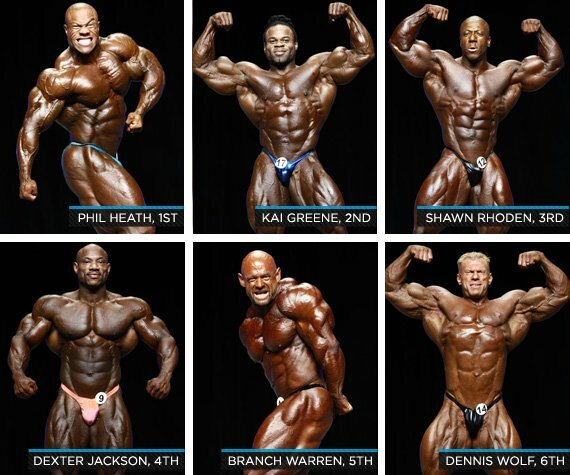 Also at stake—the top five finishers qualify for the 2013 Mr. Olympia. This means they don't need to compete in a mid-season show to punch their ticket for next year's O. While some Olympia-qualified bodybuilders choose to compete in the spring competitions, many take the full year to prepare for the next year's show. Near the end of this callout, the judges asked Dennis Wolf to move into the middle of the pack. Wolfe's odds of a higher placing were improving, and the top eight began to solidify. All eight men who had previously been called were allowed to remain in the lineup, and the judges asked an additional six competitors to step forward. These included Johnnie Jackson, Ronny Rockel, Ben Pakulski, Essa Obaid, Roelly Winklaar, and Lionel Beyeke. At this point, these pros knew they weren't going to place in the top six and earn an automatic qualification for next year's show. Of course, there was still plenty at stake—prize money and the important distinction of finishing in the top 10. 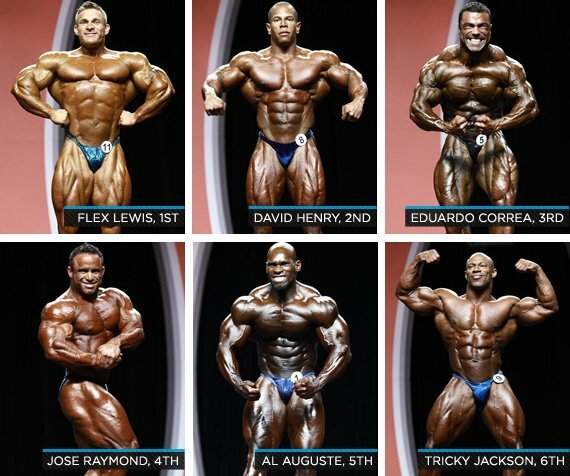 The top 10 are also called back on stage for the posedown before placings are announced. Of this group, only two would garner that honor. At this point, the show began to lurch from one event to another. After whipping the crowd into a frenzy over whether Kai would best Phil, the show jumped abruptly to women's Figure. This year, the Friday night show—where Bikini, Fitness, and Ms. Olympia champions were crowned—also tacked men's judging onto the end, creating a four-hour marathon of bronzed, muscled bodies of various sizes, shapes, and genders. After women's Figure champ Erin Stern was crowned, the Saturday night show switched to the top-six posing routines of the 212 Showdown. As Bodybuilding.com reported earlier, the top four in this division were a lock, and that proved to be the case. Our earlier call for the top spots was also six for six. Despite strong judging, we can quibble a bit about the top placings. The judges seemed to give Al Auguste full attention only after they'd committed to their top four. He could have easily placed ahead of Jose Raymond if they'd looked at him a little more closely early on, and pulled him into the top group. Because of his low placing, the crowd supported Raymond with scattered boos when he was called fourth. The crowd booed even louder when Eduardo Correa was announced third, and they were right. Correa should have finished second. Flex Lewis fell to the ground when he was announced as the winner. "I stand here as a humble champion," the Welshman said. "Never give up on your dreams. I came second-place last year." He nearly lost control of his emotions, but gathered himself. "I told myself I wasn't going to cry. I'm holding it in until I get backstage." The 212 Showdown gets more interesting with each passing year. The smaller guys have added size since last year—ten pounds, to be specific. In 2011, the Showdown was capped at 202 pounds. This year, the class has grown to 212, allowing smaller bodybuilders to more effectively fill out their frames. We expect the drama in this division to intensify over the coming years as rivalries get more firmly established. Before the posedown and the Mr. Olympia placings were announced, Bodybuilding.com gave awards to the most popular supplements in the industry. Optimum Nutrition's Gold Standard 100% Whey won supplement of the year. This was followed by a promo for the bodybuilding film "Generation Iron," from the producers of "Pumping Iron," which will be in theaters in 2013. The promo was short and well executed. All bodybuilding fans should put this coming attraction on their radar. The top men in the Mr. Olympia competition were called onto the stage, with Johnnie Jackson (9th) and Lionel Beyeke (10th) anointed from the third callout. The posedown began, and the bodybuilders hit a few poses on stage before strutting down into the audience. For a moment, Kai Greene was the only competitor on the stage. Then the placings were announced. Dennis Wolfe pulled himself up to sixth, while the top five remained consistent from the day before. Dexter Jackson finished fourth ahead of Branch Warren, who has been sharper when he's placed higher. Perhaps the most important testament to the good judging of this show was Shawn Rhoden's lofty third-place finish. Lesser-known bodybuilders often finish behind bigger names, but Rhoden deserved this spot. 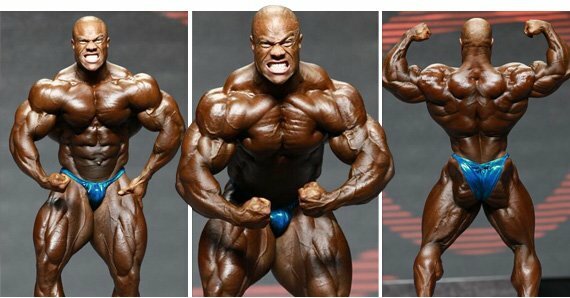 When Phil Heath was announced as the winner, he fell to the ground, overcome with emotion. Finally, he rose and spoke. "Wow. I can't believe it. Wow. First of all, I'd like to thank God. Over the past year, I've gone through so much—and it's been a helluva a fast year. I have to give props where props are due. Especially to Kai Greene. I want to give a round of applause to all the guys who competed. "As I was getting ready for this contest, I was doing an appearance in Trinidad and Tobago, and I saw that 70 people were [shot; 12 were killed] in the Colorado shooting. And the wildfires. I told my best friend that I have to win [the Mr. Olympia] for them. People in Colorado are resilient. I wanted to give them something to smile about." You did, Phil. You gave everyone the best possible gift.